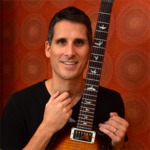 Guitarist, teacher, author, and owner of Guitar-Music-Theory.com, Desi Serna, takes you beyond guitar basics, presenting intermediate and advanced level information on how music works and gets applied to the guitar fretboard. 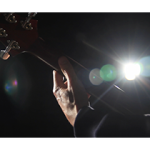 Through Desi’s website, blog posts, books, and videos, you receive the instruction you need to increase your knowledge of music, understand the construction of popular songs, and improve your improvisational and compositional skills. The guitar instruction available on this website is based on Desi’s popular books, Fretboard Theory, Fretboard Theory Volume II, Guitar Theory For Dummies, and Guitar Rhythm and Technique For Dummies. 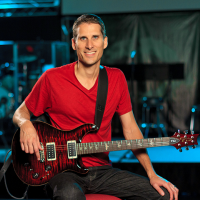 Desi is also the author of How To Teach Guitar and Start Your Own Music Instruction Business. If you already have a handle on the basics of guitar playing and you want to take your knowledge and skills to the next level and beyond, then peruse the website, read a blog article, watch a free video, join the email list, and become a Fretboard Theory member. 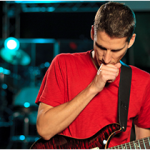 What Scales Should a Guitar Player Learn? In music, a scale is a series of notes played in ascending and descending fashion. 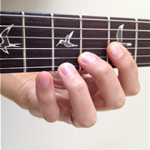 Scale notes make patterns on the fretboard, which guitarists finger and pick position to position. 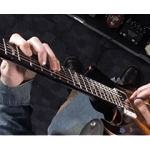 Guitar players use scales to play melodies, riffs, solos, and bass lines. What is the Secret to Building and Using Chord Forms on Guitar? There are literally thousands of different kinds of chords and chord shapes that can be played on the guitar, but did you know that most are related in some way to just five core forms? In the open position the five forms are C, A, G, E, and D. What does that spell? CAGED. With the guitar CAGED chord system, you barre each of the five open forms and move around the neck playing different chords in other positions, but that’s only the beginning! How Do Guitarists Play Chord Progressions and Use the Number System? 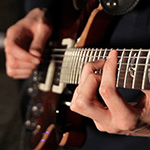 What Are Modes and How Do Guitarists Play Modal Scales? One of the biggest mistakes guitar players make is to assume that the modal concept is just a theoretical idea that doesn’t really have a practical purpose, but this is not true. Most music is based in a mode in one way or another and recognizing modes is critical to understanding how music works. Chord progressions, melodies, harmonies, riffs, lead guitar solos, and bass lines are all derived from modal scales in some fashion. Understanding the modal concept is absolutely necessary if you want to become a knowledgeable, versatile player. 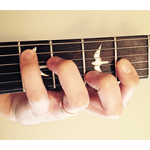 How Do Guitar Players Learn the Fretboard?